I had to share a picture of my yummy salad. 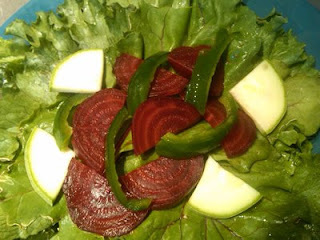 All the parts came from the community garden--lettuce, beet greens, zucchini, green pepper, and beets. The lettuce and pepper came from a fellow gardener (thank you Adam!) and the rest came from my department's 3' X 6' raised garden. So why are more people participating in community gardens? I think it's more than for the vegetables. It's getting to know people while watering and weeding. It is learning about plants, about when to thin the plants, and about when to pick the vegetables. (Thank you for sharing your knowledge, Clint!) It is about sharing the harvest with others. And it is about eating!! I am glad that I decided to participate in the SLCC community garden. I like watching my garden grow!